Recently, a large quantity of oil began flowing into the Wastewater Treatment Facility. 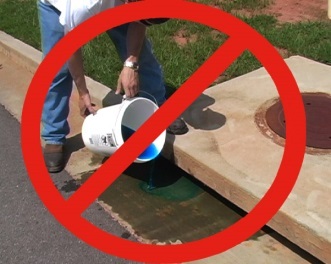 It is illegal to pour oil and other petroleum products, cooking oil or industrial solvents in the drain in your home or business, or in the storm sewers at the curb. Not only is this illegal and bad for the environment, it causes major problems for the sanitary sewer system in the City. It damages equipment and severely disrupts the biological processes that need to occur to treat our wastewater, as well as producing quality compost. Do not dump oil, grease and solvents down any drain. Dispose of them properly. If you change your oil at home, it can be disposed at any oil change location, as well as some auto part stores. If a company does oilfield work, it must be disposed at an approved facility, not down a shop drain. Solvents can be disposed properly at the Campbell County Landfill. Cooking oil can be disposed in your garbage. Let it cool and place in a container, like a milk jug. If you see anyone disposing of any of the these products improperly, please contact the City of Gillette Wastewater Division at 686-5274.